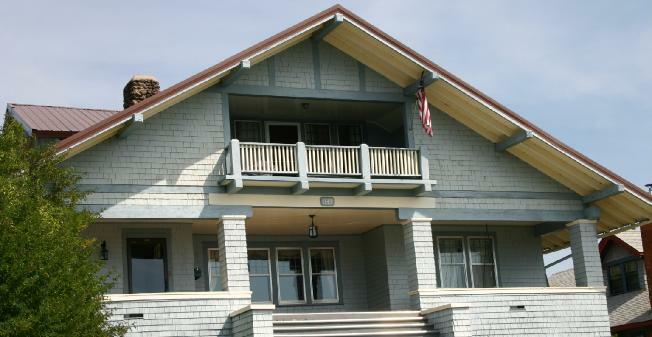 Enjoy the commanding views from the expansive front porch and upper balcony of this impressive Craftsman home. An open floor plan complements this home's uniquely crafted hardwood floors, unpainted woodwork and fireplace made of native stone. Rooms are large with an elegant living room/dining room and an additional great room. The full basement offers lots of finished storage. Mature landscaping graces a fenced backyard and quaint patio space. The home also features a detached two-car, tandem garage with RV door and an enclosed hot tub. Located at the end of a quiet street on a huge lot, the property is close to Montana Tech, hiking trails on Big Butte and John F. Kennedy Elementary. 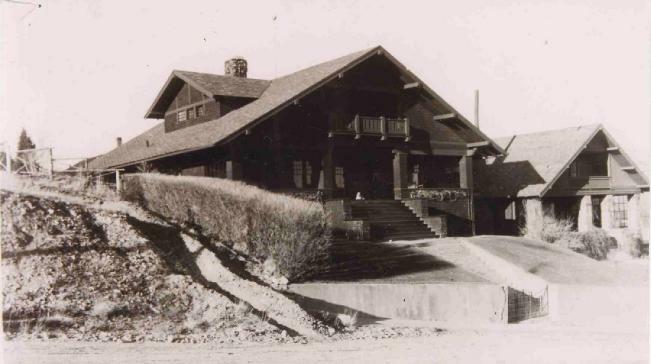 Designed by internationally renowned architect Gustav Stickley, a pioneer of the Arts and Crafts Movement in America , this home is one of the most historically significant in Butte . BONUS: detached 500 sq.ft. urban loft-like guest house, newly remodeled in 2008, with one-bed, one-bath, separate sleeping loft, w/d and a new, full kitchen with dishwasher. Separately metered with a good rental history, it's a great income producer or could be used as a workshop, craft-room or mother-in-law suite. No. 65 as drawn in The Craftsman. A period photo of the home shortly after it was built. The home as it looks today. 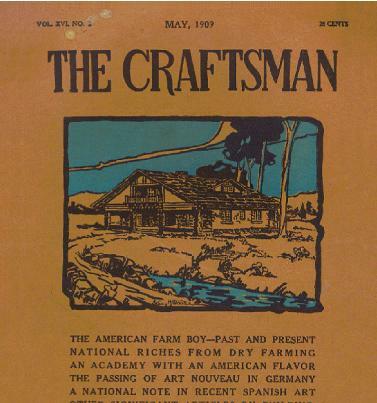 The May 1909 issue of The Craftsman featured the house on the cover. Gustav Stickley must have loved this design, for he featured the drawing (and house, of course!) of No. 65 on the cover of The Craftsman twice, and on the cover of at least one of the editions of More Craftsman Homes. The built version of this home has recently been found in Butte, Montana. 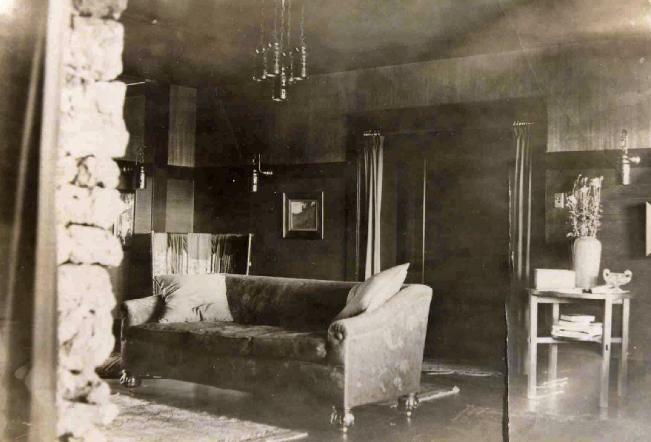 While there are some small changes, it appears from the historical photos shown here that the home was constructed very close to Stickley’s concept. It can also be seen that the furniture and light fixtures chosen for the home were not from Stickley’s Craftsman Workshops, but a more eclectic blend of styles. 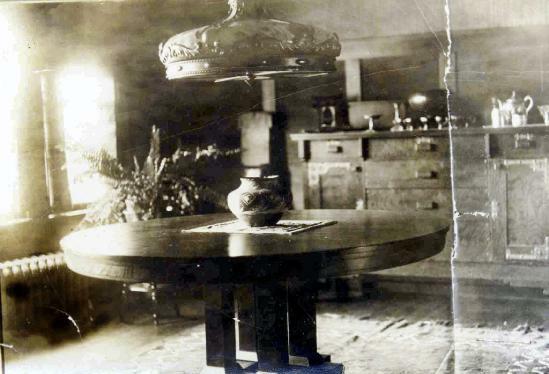 Extant old photographs indicate that while the beamed ceilings were not installed and the fireplace was not brick, the home had the woodwork as pictured, although a grass cloth wall covering might have been substituted for the tongue and grooved panel boards below the plate rail in the dining room. The bookcase next to the fireplace did exist, but has been removed. 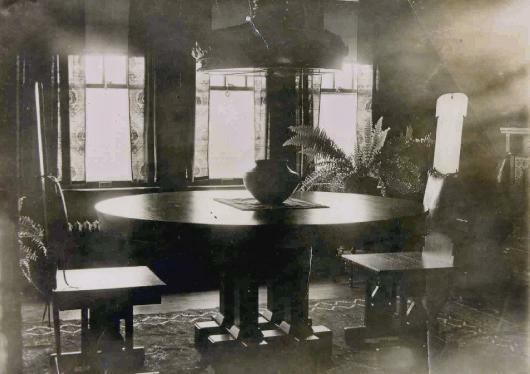 Interestingly, the dining room chairs, table and sideboard appear to be the work of Buffalo, New York, arts and crafts designer Charles Rohlfs. Other furniture appears to be “mission oak,” but not by Gustav Stickley. The bench pictured was probably in the entrance foyer. The lighting appears to be very modern for the period, more European than American Arts and Crafts. 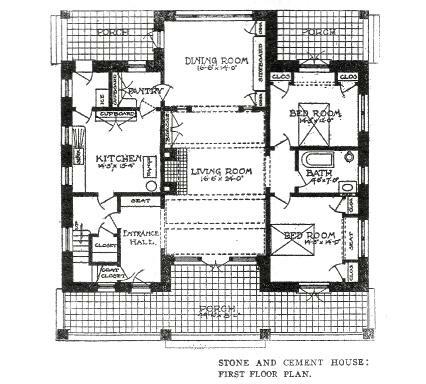 The only drawing of the interior—the living room—as pictured in The Craftsman. 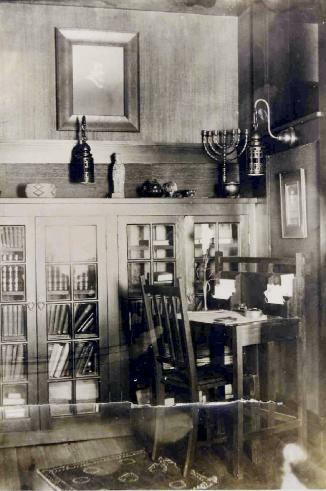 The planned bookcase next to the fireplace has been removed—but it did exist as shown in this period photo. A recent photo shows the interior of the living room with the entrance foyer to the left. A rubblestone fireplace was built instead of the more sophisticed brick design in Stickley's plans. 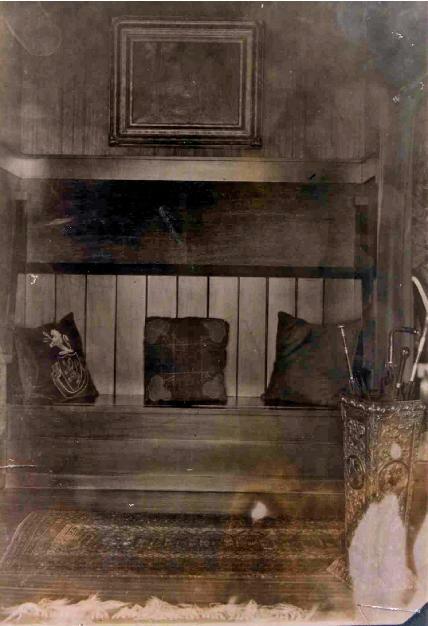 This tall-back built-in bench was probably in the entrance foyer. 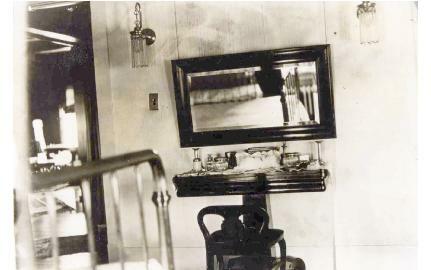 A view of a bedroom on the first floor (lower right), note the brass bed and the wall lamps. 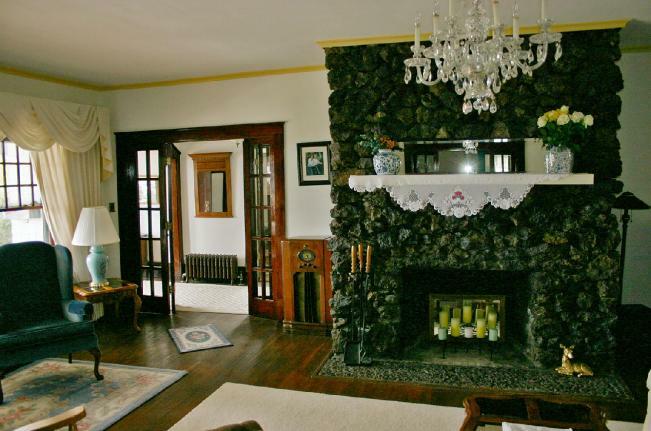 The period photo of the living room looking past the fireplace on the near left shows the post and panel divider that separates the dining room (left, rear). Two period photos of the dining room with its interesting furniture—after studying the images it appears this furniture is by Buffalo, New York, maker Charles Rohlfs. As his furniture was hand made in a small shop it is a rare find, especially in the wilds of Montana!